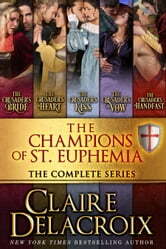 The Champions of St. Euphemia Boxed Set includes all five medieval romances in this thrilling series by Claire Delacroix. You'll join the quest to deliver the treasure from Jerusalem to Paris in The Crusader's Bride. Gaston makes a marriage of convenience with Ysmaine, knowing he needs a son, but soon realizes how little he knows about his new wife. Does he dare to trust her? Can Ysmaine win the heart of her new husband? Follow Wulfe in The Crusader's Heart, after he encounters the courtesan Christina who refuses to be left behind in Venice. Maybe this alluring woman is exactly what the orphaned knight needs to reawaken his heart and convince him to solve the riddles of his past—can he build a future with Christina? Ride north to England with Bartholomew in The Crusader's Kiss, in his own quest to reclaim his stolen legacy and avenge his parents: little does he expect to find a woman leading a band of thieves in the forest, much less to pretend she is his wife to undermine the villain. Continue to Scotland with Fergus in The Crusader's Vow as he returns home after his military service only to find his betrothed has wed another man. A marriage of convenience with his friend and the disguised Saracen Leila seems a fitting compromise, but Leila will not be satisfied until she and Fergus are more than friends and even lovers: she wants to claim his heart for her own. The treasure finds its final sanctuary in Radegunde and Duncan's tale, The Crusader's Handfast, a May-December romance between Ysmaine's maid and Fergus' man-at-arms, a warrior who believes love has left him behind. Radegunde holds the secrets of her lady, but also proves to have the power to steal Duncan's heart. The Champions of St. Euphemia Boxed Set includes the complete series of five medieval romances in Claire Delacroix's sweeping historical series.